The Pediatric Brain Tumor Foundation, the world’s leading nonprofit dedicated to children with brain tumors, is happy to announce that the Childhood Cancer Survivorship Treatment Access and Research (STAR) Act has passed the House of Representatives, after passing the Senate in March. This important piece of bipartisan legislation will advance pediatric cancer research and child-focused cancer treatments. The Act will also improve childhood cancer surveillance and provide enhanced resources for survivors and those impacted by kids’ cancers. 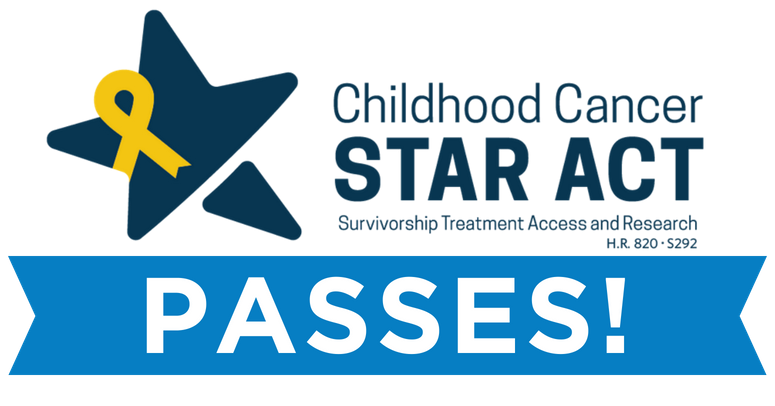 “The Childhood Cancer STAR Act is the most comprehensive childhood cancer legislation ever taken up by Congress. It puts policies in place that help ensure more gets done to change the treatment landscape and improve outcomes for children with cancer,” says Dr. Joanne Salcido, Vice President of Research and Advocacy at the Pediatric Brain Tumor Foundation. Childhood cancer is the number one cause of death by disease for children in the U.S., and pediatric brain tumors are the deadliest form of childhood cancer. Children who do survive often suffer life-long side effects from treatments. The STAR Act will help change the outcome for these children – funding research to improve quality of life and helping to achieve the PBTF’s vision of a world without childhood brain tumors. As a member of the Alliance for Childhood Cancer, the PBTF strives to unify the pediatric brain tumor and childhood cancer communities in educating lawmakers and promoting the interests and needs of young cancer patients. We encourage supporters to contact their Senators and members of the House of Representatives to thank them for making childhood cancer research a priority by passing the Childhood Cancer STAR Act. Learn more about the STAR Act here.